If you’re off to university this September then you’re probably starting to get nervous and excited about what to expect. And no doubt you’re working through a list of things you need to do and buy before you start the next chapter of your life. Amongst the pots and pans, iron, ironing board, washing basket and new books you should also add the meningitis W vaccine to the list. New research published last week shows the rise in meningitis W cases, especially amongst students. As a student accommodation management company it’s our duty to offer first class care to all our tenants and if GPs are seeing an increase in meningitis W then we want to make sure you’re all protected as much as possible. We’ve all heard of fresher’s flu, something that most first year student’s will suffer from within the first few weeks of being a student. Partying hard and neglecting your wellness is all part of the student initiation, but we’d hate for you to miss out on lectures and seminars with something more serious. Meningitis W isn’t something to panic about but if you’re worried or concerned then please do call your local GP surgery to get more info before making an appointment for the vaccination. Prevention is always better than cure so do what you can now to be protected and ensure your September term gets off to the best possible start. Research from the Higher Education Statistics Agency reveals that the number of students now living in privately rented student accommodation has more than doubled in recent years and looks set to soar. Between 2007 and 2014 the number of students living in privately rented accommodation increased from 46,000 to 102,200, which, according to Knight Frank has been linked to the preferences of today’s students and their desire for a premium living experience. It’s safe to say that privately rented accommodation is a much more attractive proposition to on-site campus accommodation. Private accommodation is often purpose-built, offering a high standard of living with all mod-cons and bills thrown in. With high speed broadband, 50” TVs and dishwashers offered as standard, it’s no surprise that this type of accommodation appeals to a commodity driven population of students who have access to brands at their fingertips thanks to the rise of social media. But it’s not just student’s benefitting from this type of accommodation, investors are benefitting from it too. As demand for purpose-built, privately owned accommodation continues to grow, now is definitely the time to get on board with a developer with their finger on the pulse when it comes to providing students their dream housing solution. 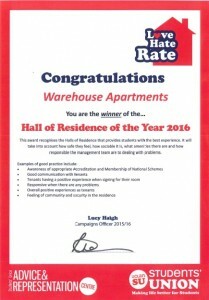 We currently manage seven student accommodation sites around the UK in Manchester, Sheffield, Leicester, Preston, Huddersfield and Chester but we’re always on the lookout to develop sites across the UK in popular university cities. The number of UK-based and overseas students choosing to live and study in the UK is increasing year-on-year and universities haven’t got the capacity to house the influx of new students each year. Now is definitely the time to invest in student accommodation and invest in a brighter future.